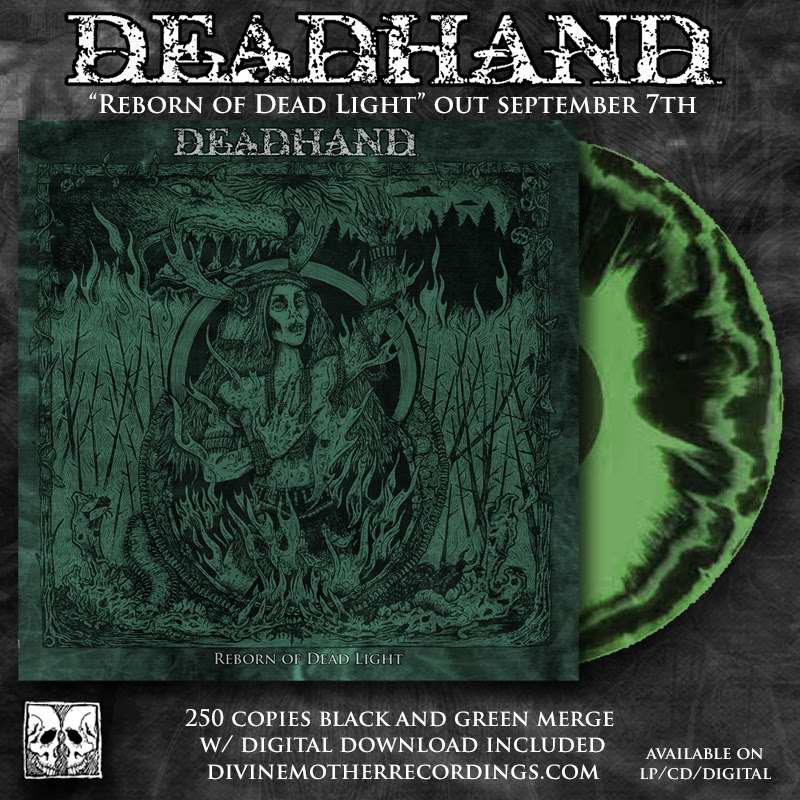 Sludge/Post-Metal DEAD HAND‘s upcoming album ‘REBORN OF DEAD LIGHT’ set for release Sept. 7th via Divine Mother Recordings; Pre-orders available now! Dead Hand is a full widescreen sludge experience. With keyboard-expanded instrumentation and the panorama of post-metal, they’re a truly doomed, sonic horizon whose bleak beauty deliberately unfurls a slow-rolling tsunami to sweep oceanic ruin over fallen kingdoms. ‘Their second full-length, ‘Reborn Of Dead Light’ is set for release on September 7, 2018, via Divine Mother Recordings. The album was recorded and mixed between February and September 2017, with mastering completed in January 2018, all by Matt Washburn at Ledbelly Sound Studios in Dawnsonville, GA. The striking album cover artwork and design is by Jean Saiz. – Vinyl press is limited to 250 copies on Green and Black Merge, with full color jackets and insert. Includes digital download code. – Compact Disc (CD) is limited to 50 copies on full color disc, with two-panel insert on Black Arigato Pak jackets. Includes digital download code. **The CD version includes the bonus track “Them Bones”, a Dead Hand cover originally recorded by Alice in Chains, and featuring Eric Crowe of Crawl on guest vocals. 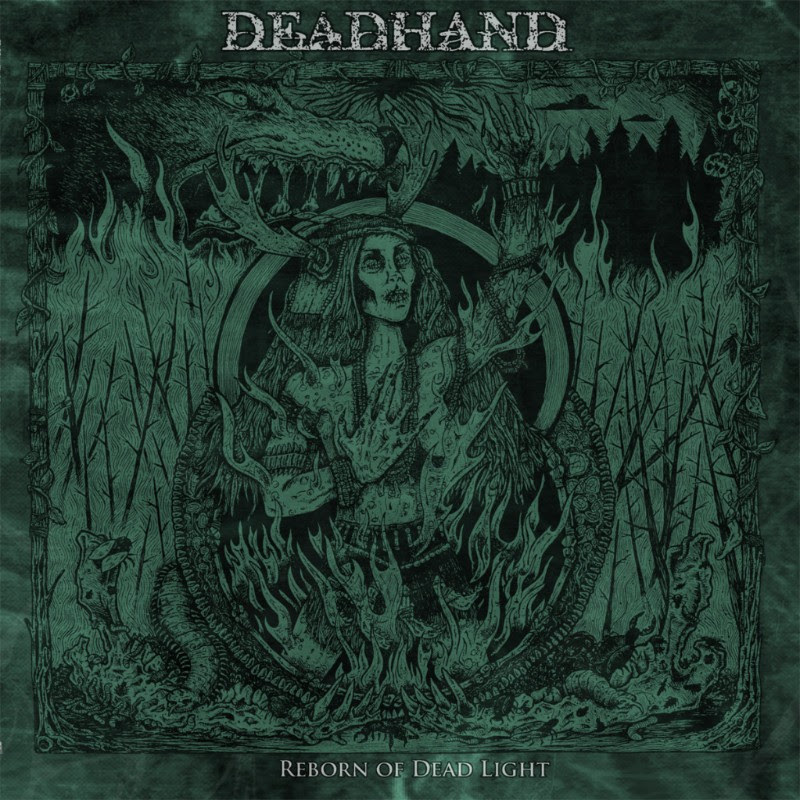 An idea brewed in 2012, quickly finding its fruition as a full lineup by 2013, Dead Hand hit the ground running with a split release on Divine Mother Recordings with Philadelphia shredders Repellers in January 2014. Mastered by Dan Randall of Mammoth Sound (Ash Borer, Noothgrush, Unearthly Trance), the split received stellar reviews and the first pressing sold out almost immediately. An EP release in July and regional touring filled the remainder of 2014. Dead Hand released their first full-length, ‘Storm of Demiurge’ In June 2015, on Divine Mother Recordings (USA) and Third I Rex (Europe). 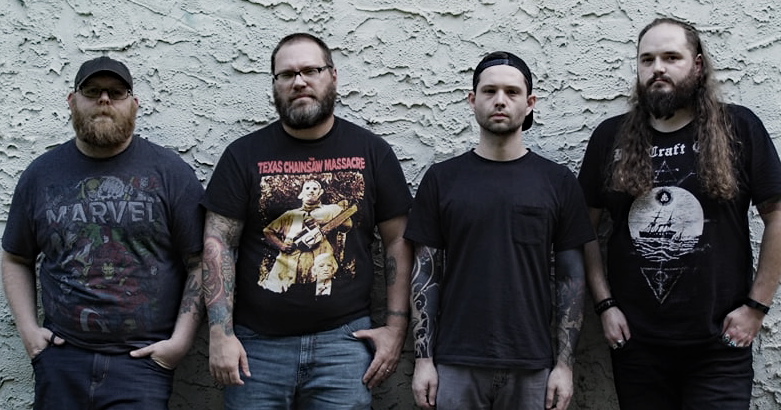 The band entered Ledbelly Sound Studios with Matt Washburn (Mastodon, Norma Jean, Leechmilk) for a 2016 released split with Miami sludge trio, Shroud Eater, on Southern Druid Records. Dead Hand is a well oiled touring machine spanning the Eastern U.S. over the past several years. More dates being confirmed now in support of their upcoming release of their second full-length ‘Rebord Of Dead Light‘, via Divine Mother Recordings. ‘Rebord Of Dead Light‘ will be available on CD, Vinyl LP, and Digital Download or Streaming on September 7, 2018. MANEGARM – Upcoming Album Fornaldarsagor Out On April 26! Indianapolis Trad-Doom Trio SPIRIT DIVISION: ‘FORGOTTEN PLANET’ streams in full at Indy Metal Vault; Album drops Friday, August 31st! DESERT ROCK LEGEND BRANT BJORK PREMIERES NEW SONG!